Link your wing structures together to make multipanel wings. For example a classic “polyhedral” glider wing. Much improved (and far more buildable) control surface and hinge designs. Vastly improved part nesting in the layout sheets. Control surfaces! Specify the hinge line and the start/end station and your control surface is built automatically. Supports multiple independant control surfaces per wing. Version checking. Alert if a newer version is available for download. Warn if trying to build before all design changes have been saved. Delete wings from previous design when opening a new design. 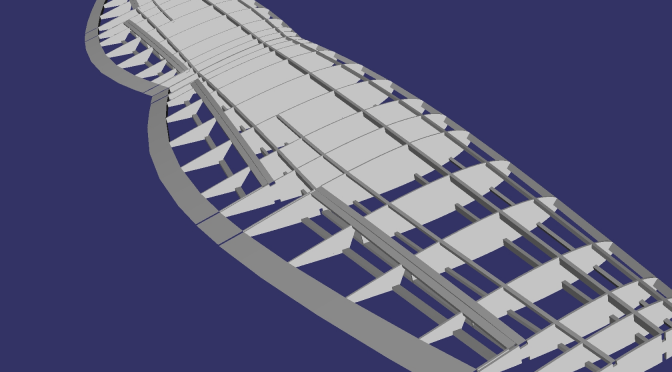 Spars are now always vertically aligned after rib is rotated for twist/washout. Stringers are always aligned flush/tangent to the surface of the rib. If asking to view the design in 3d, check if file is saved (clean) and built since last save. Fix output of .svg (plans/templates/laser cutter sheets) so they are created in the same folder as the original .mad file. Add a suite of examples that illustrate many of the software’s capabilities. Support for curved chord/taper wings. This is done by defining a spline curve that evaluates to the chord at that point in the wing. See docs and examples for more details. Support for curved sweep wings. This is probably a less useful feature, but is available nonetheless. Instead of specifying a sweep angle, a spline curve can define the amount of forward/aft shift of the wing ribs relative to the span of the wing. Again see the docs for specific explanation and examples. Add helper functions for selecting root and tip airfoils. Changes to combo box trigger internal change detection. Clean/dirty management, system suggest save if design is changed before quitting or loading a new design. Initial GUI front end interface to working back end build library. Bug fixes when generating 3d model for wings with sweep and dihedral. Integrated creator, builder, and viewer into single GUI. Simple XML format for saving model designs. Visualize the exact model that is generated in 3d. Variety of bug fixes and clean ups. Cutting out basic shapes from airfoils for leading/trailing edges, spars, stringers, lightening holes, etc. Best fit of leading edge cutout. Best fit of trailing edge stock to airfoil shape. Higher level function: cut flaps or ailerons into the wing structure.